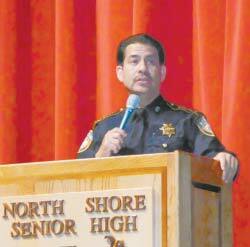 PUBLIC OFFICIALS took the stage at the sheriff’s Safety Meeting, held last Tuesday evening at the North Shore High School auditorium. Included, at top right are Constable Ken Jones, Commissioner Jack Morman, GPISD Chief Bryan Clements, HCDA Devon Anderson. At top left is Sheriff Adrian Garcia, and others on both levels are his Deputies. 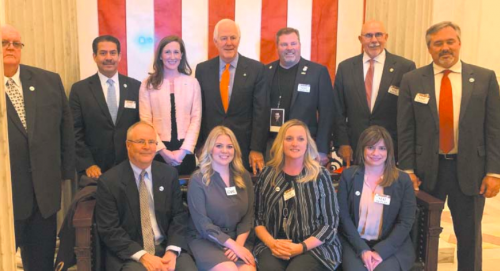 NORTH SHORE – Sheriff Adrian Garcia brought together about 30 law enforcement officers, to report on their efforts to reduce crime and “make Harris County the safest county in the nation” as voiced by District Attorney Devon Anderson. 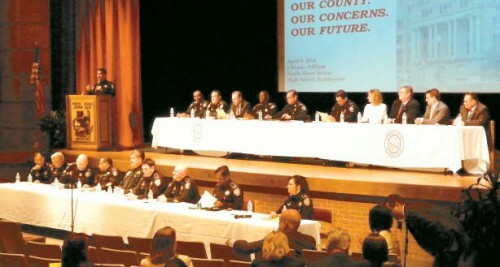 The huge Town Hall meeting was held at North Shore High School, and was not in response to a particular crime event, but more of a county-wide effort to involve the citizenry in crime reduction techniques. Precinct 2 Commissioner Jack Morman was a joint sponsor of the event, with the Sheriff. About 250 people were in attendance, as well as another 50 law enforcement officers in addition to the ones that appeared on the stage with the Sheriff, and spoke about their particular roles in public safety. Attending and speaking were Constables Ken Jones, Chris Diaz, and Phil Sandlin, County Commissioner Pct. 2 Jack Morman, County District Attorney Devon Anderson, and Galena Park ISD Police Chief Bryan Clements. Each official in their turn explained the functions of their office, and the special initiatives they have taken to reduce crime or operate more efficiently. Sheriff Garcia spoke about needing more deputies, and in fact with Morman’s help he has been able to field 140 new patrol deputies. He has implemented realtime communication with his patrols and investigators. He has sponsored youth Explorer troops to prepare young men and women for careers in law enforcement after public school. District Attorney Devon Anderson spoke about her experience over 20 years prosecuting all types of crimes, and when her office takes the initiative to investigate and prosecute. Otherwise, she said, most of her work is in support and reactive with other law enforcement agencies. However, she has established several types of special prosecuting units, including human trafficking and capital murder cases. 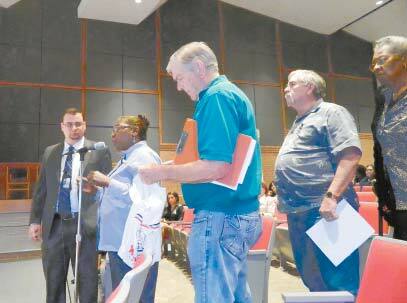 She urged citizens to contact her office when needed, at harriscountyda.com. Pct. 2 Commissioner Jack Morman said that his role on commissioners’ court is to help set and approve budgets for county offices, including the Sheriff. He noted that more money has been made available for law enforcement, and 140 new patrol officers have been added. He also said they will be used soon to enforce new regulations against illegal game rooms, noting that their fines and licenses will pay for this enforcement. Constable Ken Jones mentioned his lifelong relation with North Shore, having been a resident for 31 years. He said his patrol officers have a response time of only 3 minutes, even though they cover a large area. He also has a Task Force, working with the Sheriff, that is charged with proactive crime prevention. So far they have accounted for 40 felons arrested since the inception of the unit. He said he has been more efficient by using contract deputies to supplement his force. He urged citizens to report crime they observe on his Facebook page, which he monitors every day. Constable Phil Sandlin said his main responsibility is watching for Terrorism in port, bridge and highway facilities in his district, Pct. 8. He announced that his officers Tuesday had just arrested a woman in a traffic stop, with $200,000 in drugs that were destined for distribution in Beaumont. Constable Chris Diaz said he works with 8 municipalities in his district, meets with the public at civic clubs and other events, and urges citizens to use his website for reports. It is hccp2.com. 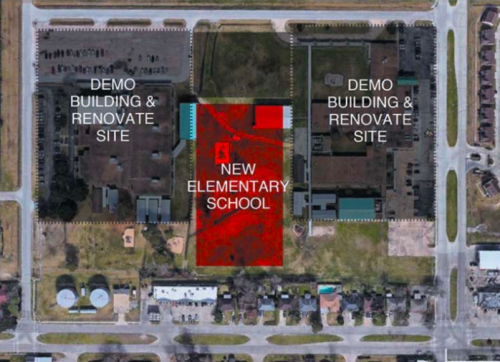 Galena Park ISD Chief Bryan Clements characterized his duties as different than the others, since all of his constituents are 18 years of age or younger, i.e. school students. He expands his staff by partnering closely with Pct. 2 and Pct. 3 constables, he said. His campus based police officers have special training every year for the special needs of a school environment, to make it safer. Sheriff Garcia asked some of his other command officers to explain their functions, including Assistant Chief Armando Tello, Deputy Chief Fred Brown, in charge of the jail inmates, and Dr. Seale, the medical director of his staff at the jail. Tello spoke on his coordination with other agencies, Brown said that he is responsible for 9000 inmates at the jail, of which 400 new ones are processed every day, and Dr. Seale said he was in charge of a medical staff of 460 that provide all types of services to the inmates. Sheriff Garcia said that his budget is over $400 million, most of it in salaries, but that he has been able to reduce overtime in his 3 years in office from $40 million to $8 million. In a demonstration of how citizens can help thwart crime, he had his officers check cars in the parking lot during the meeting. Of 230 cars, 59 failed an inspection due to obvious object in view that could be stolen, or open windows and doors. About two dozen people asked questions next, with topics ranging from illegal drugs sold to students (synthetic marijuana for smoking), to noise of barking dogs, concern about open carrying laws for guns, follow-up on crimes that have been reported, property that is overrun with trash and homeless people, prostitutes working some streets, toxic water in wells, DUI problems, gang activity and more. Garcia closed by reminding all that the reason for the meeting is to hear how his office is performing, and how it can improve.